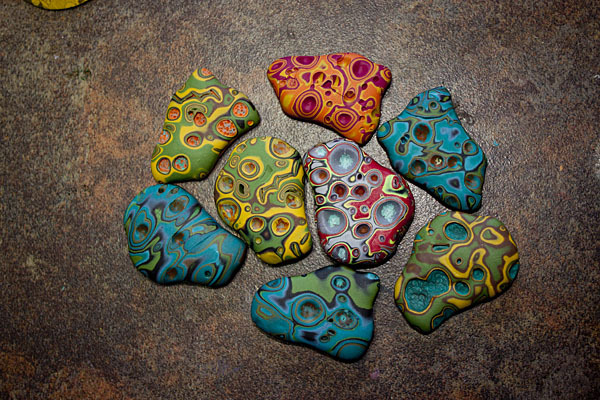 Polymer clay may stain. CLAY MAY DAMAGE UNPROTECTED FURNITURE OR FINISHED SURFACES. 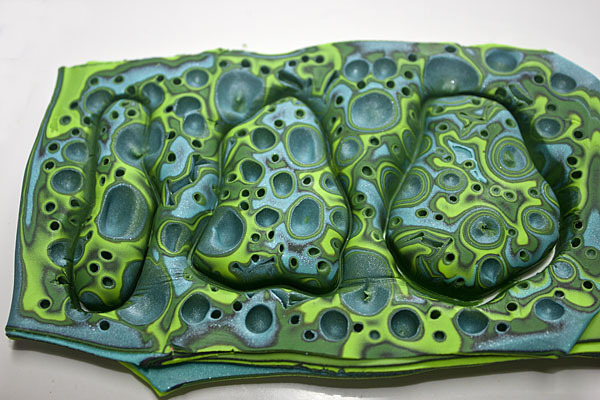 DO NOT USE polymer clay on unprotected surfaces. 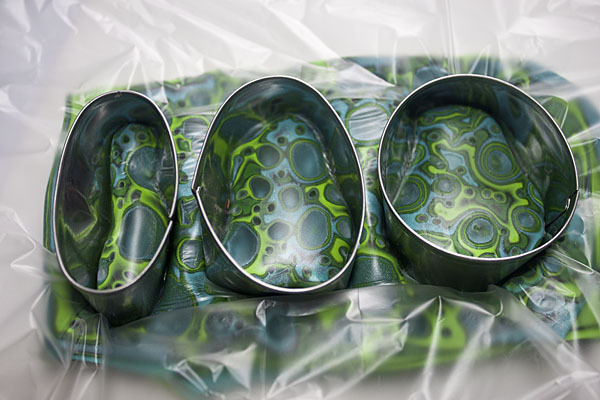 We recommend working on the Sculpey clay mat, wax paper, metal baking sheet, or disposable foil. Start with clean hands and work surface area. Knead clay until soft and smooth. For best results, clean your hands in between colors. 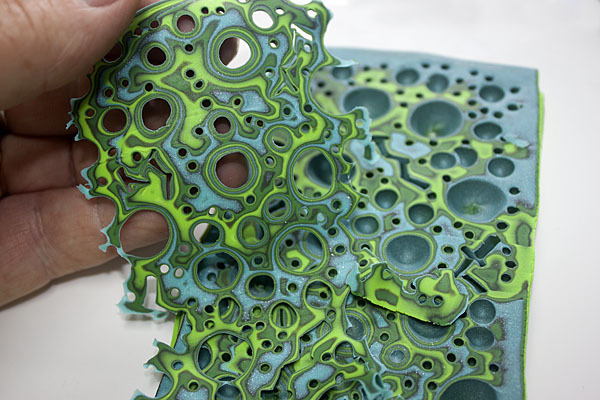 Shape clay, pressing pieces together firmly. Bake on oven-proof glass or metal surface at 275°F (130 °C) for 30 minutes per ¼” (6 mm) thickness. For best baking results, use an oven thermometer. DO NOT USE MICROWAVE OVEN. DO NOT EXCEED THE ABOVE TEMPERATURE OR RECOMMENDED BAKING TIME. Wash hands after use. Baking should be completed by an adult. Begin by preheating oven to 275 °F (130 °C). Test temperature with oven thermometer for perfectly cured clay. For best results, condition all clay by running it through the Clay Conditioning Machine for several passes on the widest setting. 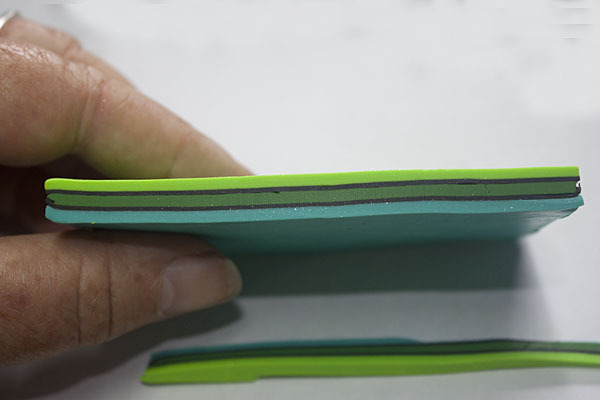 Fold the clay in half after each pass and insert the fold side into the rollers first. Step 1: Roll half a package of each color out on the #2 setting of the Sculpey Clay Conditioning Machine. Stack the colors as shown and cut into a rectangle that is about 2×3 inches. Make sure that you have either a dark or the lightest color in between the other two colors. Step 2: Place this stack, narrow end down, into the Sculpey Clay Conditioning Machine, (set on #2), and roll through again to create a longer length of clay. 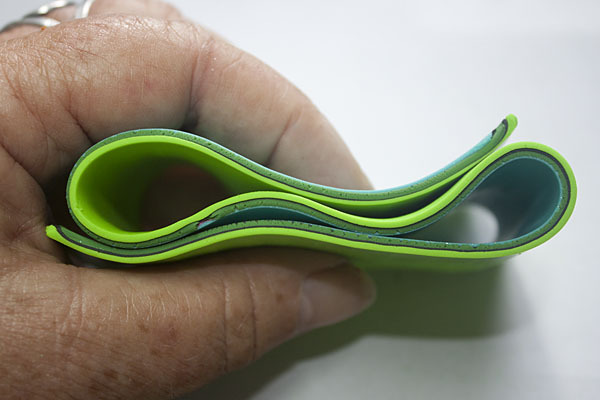 Accordion fold this clay into thirds as shown. 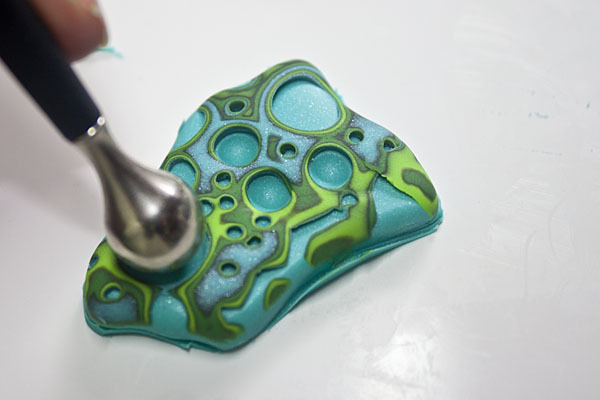 Step 4: Put the folded clay onto the ceramic tile (your favorite color up) and lightly press it to the tile. 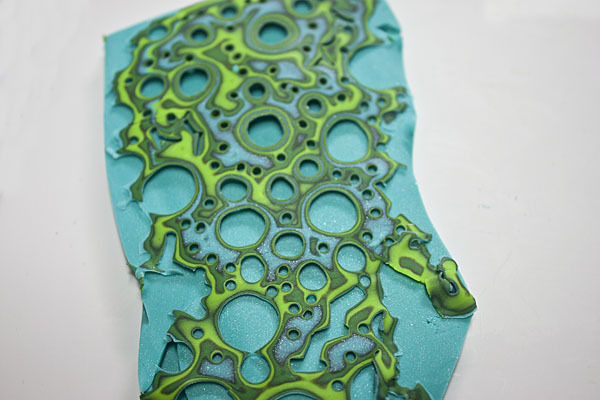 Use the largest Style and Detail tools to push holes into the clay. They should be fairly deep, but not all the way through the clay. 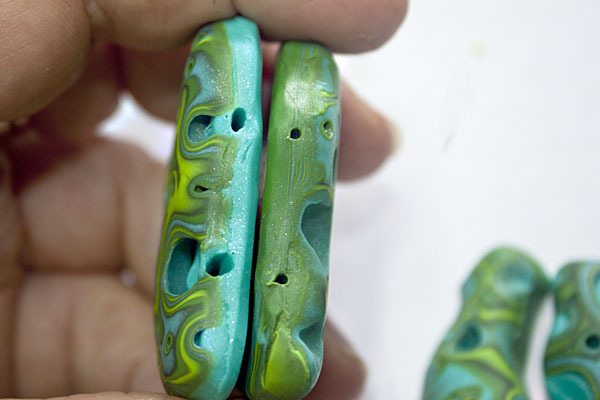 The color that is on top will be the color that appears in the large holes of the Mokume Gane. Step 5: OPTIONAL: Use the rubber chisel on the opposite end of the medium size ball tool to etch some zigzag lines into the clay stack. Step 6: Fill in with the medium and small ball tools as shown. Step 7: Slightly bend the Sculpey Super Slicer blade and cut off as thin a layer as you can to reveal the amazing textures created! Set this cut layer aside. Step 8: Place one or two #1 layers of one of the colors beneath the remaining stack of clay so that the entire stack is at least 3 #1 layers thick. 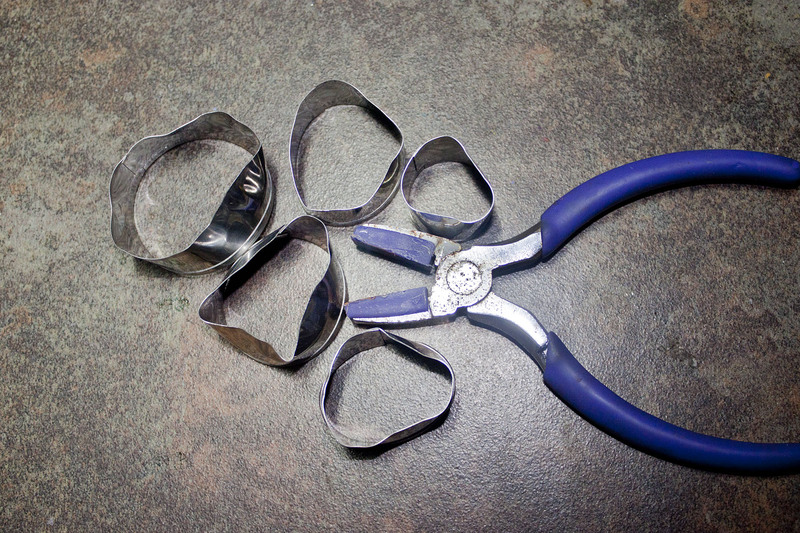 Step 9: Bend your cutters by bending only the cutting side of the cutter. 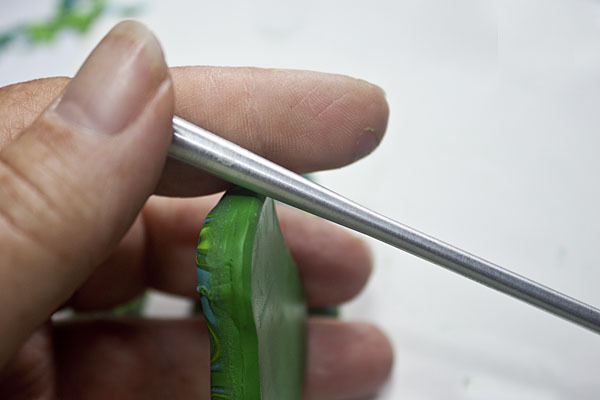 Use your pliers to gently and randomly bend this cut edge. Remember to breath! This is scary to “ruin” a perfectly good cutter! Bend the whole set – have fun! Step 10: Put a sheet of candy paper over the top and select an area to cut out with the bent cutters. Put something hard and flat on top of the cutter and press it down firmly. (Using your hand to press the cutter can bruise it!) Wiggle the cutter slightly and remove the cutter and the paper. Step 11: Use a craft knife to gently help release the cut clay from the selvage clay. 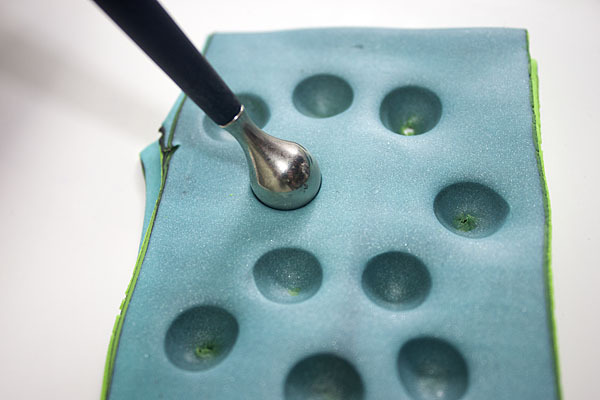 Step 12: Use the edge of the Etch n’ Pearl tool to smooth the edges and the back edge of each piece. Step 13: Stack 3 #1 (widest) layers of the color used on top of the Mokume Gane stack (the color showing in the holes). Place the cut slice of clay over the stack. Use the candy paper and cutters to cut out as many pieces as possible as directed above. 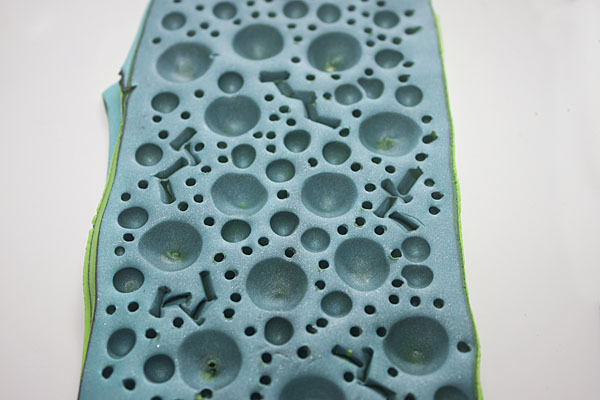 Step 14: Press the Etch n’ Pearl tools into the holes in each piece to mimic the textures on the other pieces. 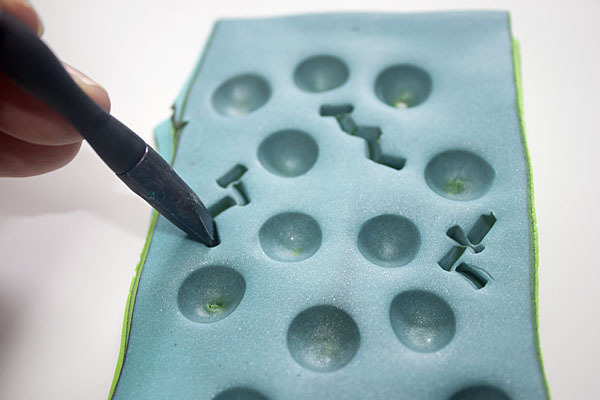 Step 15: Use the needle tool to make the holes in your finished pieces and bake according to the directions above. 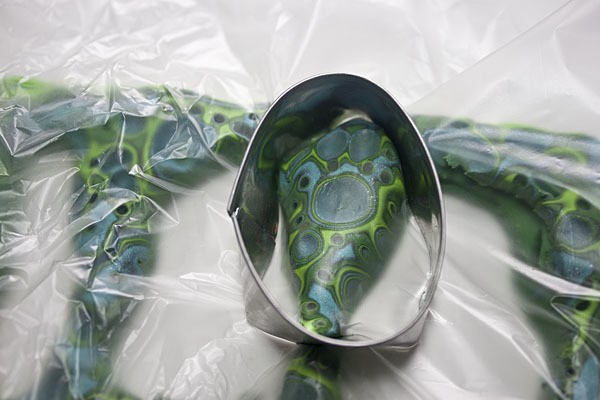 Allow the piece to cool completely before assembling your new jewelry!